Well, finally got a few nights (Friday/Saturday past, and last night) that the stars were visible here in Joplin. Not the best of conditions, but at least it wasn't 15 degrees F or colder. Only had 1 other night since mid-January that was shootable for me, so I got the rig set up, and did what I could. Fri/Sat nights I shot all night long (some decent, some so-so, some poor), imaging IC405, M81-M82, NGC3254 + SN2019NP, and M63. Oh, almost forgot.....had to deal with a waxing gibbous moon . Last night had the best conditions of the 3 nights, but only for 1.5 hours......then the usual thin high cloud layer formed, and that was that. But, I was able to get the subs for the following image before I was forced to quit. I used all 41 of the 120s Ha subs (a few will get tossed when I get more subs), calibrated them completely, did a slight crop, ran the stack thru DBE twice, and 4 passes of ABE. Then a simple stretch, which I overdid a tad. 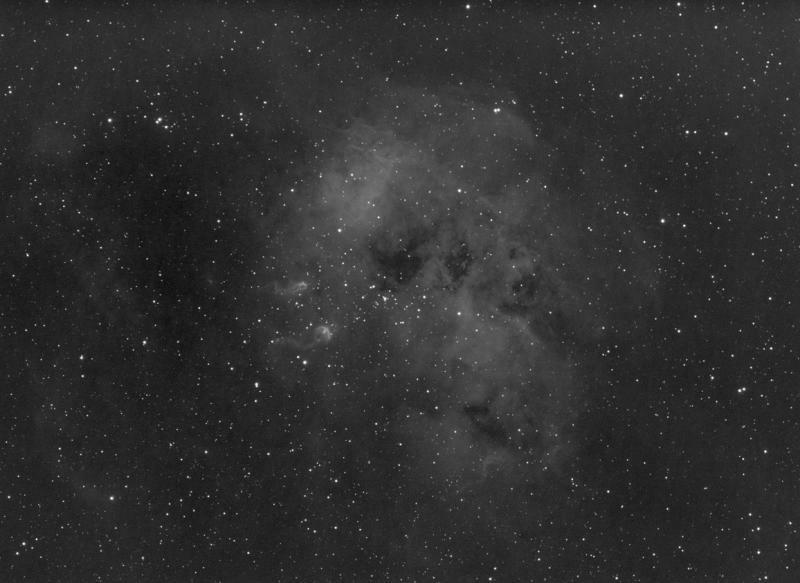 I know it isn't great (NOWHERE as good as Jon's Tadpole image from earlier ), but I'm happy to be imaging again !! And, it ain't too shabby for just over an hour of total integration time, IMO.